Sir Liam Donaldson told the seminar that despite global efforts to reduce patient harm, progress had been slow. Reducing patient harm across healthcare systems requires less hierarchy in the medical system, further research, and “more geeks”, global patient safety expert Professor Sir Liam Donaldson told a recent patient safety seminar. The Sydney seminar, co-hosted by Sax Institute, the Australian Institute of Health Innovation at Macquarie University and the Clinical Excellence Commission (CEC), saw Sir Liam join with leading Australian experts to explore ways forward to reduce the scale of patient harm in hospitals and healthcare institutions. Sir Liam, the World Health Organization Envoy for Patient Safety, said international data showed that about one in 10 episodes of hospital care resulted in harm. However, despite global efforts to tackle the issue, progress had been slow. “There are very few demonstrable improvements either in the nature of that harm or its quantity and there are very few examples indeed of any specific areas that are error prone that have been completely eradicated,” he told the seminar attended by about 150 people from healthcare and health policy fields. 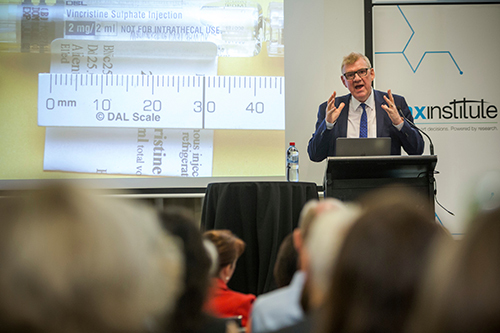 Sir Liam detailed tragic cases of medication error, including one case in which a hand-written drug dose abbreviation was misread, resulting in a baby receiving a 10-fold, fatal dose of medication. While some “enlightened” hospitals had banned the use of abbreviations entirely to reduce the risk of such error, he said abbreviations were still used in most hospitals and could still kill people. Technological solutions like barcodes on medications were another measure to reduce the risk of patients being given the wrong dose or the wrong medicine, he suggested. The medical profession’s traditional hierarchical structure was another driver of patient harm, Sir Liam said, with junior staff often reluctant to question the direction or decisions of their seniors, even when they feared patients were at risk of harm. He said a similar problem was highlighted in the airline industry, where accidents or near-misses had been found to occur when co-pilots were reluctant to challenge senior pilots. The industry had overcome the problem by getting rid of the hierarchy, he said. A panel of patient safety experts addressed the seminar (L-R): Professor Emily Banks, Professor Cliff Hughes, Sir Liam Donaldson; Ms Carrie Marr; Professor Bruce Dowton, Professor Jeffrey Braithwaite. He urged further research, saying investigations needed to focus not only on individual incidents and on systemic aggregation of incidents to uncover patterns of error, but more research was needed into the least severe category of incidents, where there had been little or no harm to patients. By studying the “near misses”, it could lead to measures to prevent more severe accidents, he suggested. “A weak signal of failure needs a strong response,” he said. 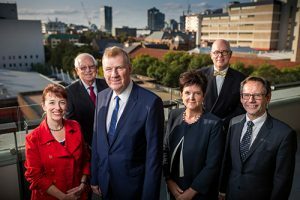 Director of the Australian Institute of Health Innovation Professor Jeffery Braithwaite also called for more research – into the cases when we “get it right”. Given the complexity of the health system, he said it was astonishing that 90% of the time, the care provided to people was safe. “We’ve looked at the 10% where harm occurs, but in a system that is so complex, 90% of the times things do go right. We’ve hardly ever researched how the system delivers safe care. Surely we need to understand how things go right and how we do produce good care so frequently”. And Professor Emily Banks, Scientific Director of the Sax Institute 45 and Up Study and former Chair of the Advisory Committee on the Safety of Medicines, said data was vital to reduce the risk of harm from medication use. “No medicine is risk free,” she said. “We need to act safely in the context of uncertainty”. She said the “post-marketing period was when large, scaled data and linked data was especially valuable. Ms Carrie Marr, chief executive of the Clinical Excellence Commission (CEC) told the seminar that the challenge was to ensure the habits of safety and reliability were “in the DNA” of every organisation and every team member in the health system. She said the CEC was looking at how to create understanding and ownership of quality and safety as a “systems property” ‒ or something that the health system does every day. It was doing so through three main focuses: organisational leadership; clinical leaders and managers capacity (an often forgotten part of the system); and team and individual capability, she said. Finally, Sir Liam issued a plea for a “new breed of patient safety geeks” to investigate patient safety incidents and come up with solutions, much like the airline safety geeks he had witnessed dissecting accidents or near misses to ensure they didn’t recur. Unfortunately we will not be able to make a video of the event available due to technical issues.